Your kitchen is prime real-estate for clutter. It becomes your catchall for mail, car keys, backpacks…the list goes on. Before you know it, you’re buried under clutter. Here’s a list of a few ideas for you to declutter your kitchen. 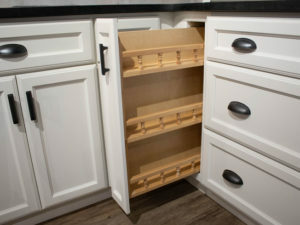 A base pantry pullout can serve many purposes. They work as a spice rack. This ensures that spices and other baking essentials are easy to reach when you need them. 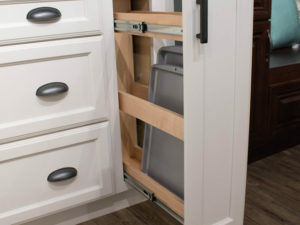 A base pantry pullout also helps organize cooking sheets, cookware, and lids. Rollout shelves and Lazy Susans both serve the same purpose. They both make hard to reach items easier to find. Both can keep the cabinets free of clutter as well. 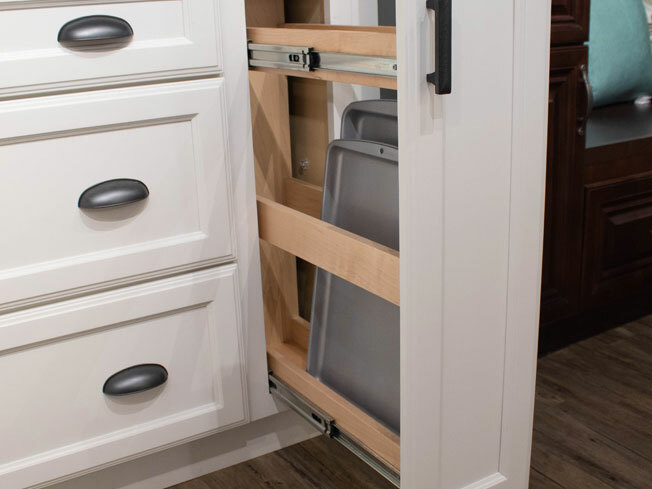 Rollout shelves are perfect for storage containers and cookware. Use them to help organize your cans of green beans or for your baking supplies. Lazy Susans are great for organizing pots and pans. They can also help organize your cereals or larger sized supplies. Cookbooks are great to have, but often take up a lot of space. If you’re thinking about a kitchen island, consider incorporating a cookbook cubby. It’s a great way to make sure that the cookbooks are available, but out of the way. Speaking of out of the way, an appliance garage is perfect for clearing off your counter. Appliances like mixers are often bulky and heavy. If you happen to bake often, lifting these heavy pieces can put a strain on your back. The appliance garage makes them available for use but freeing up your counterspace. I love these hooks. Use them to hang up your utensils for easy reach. 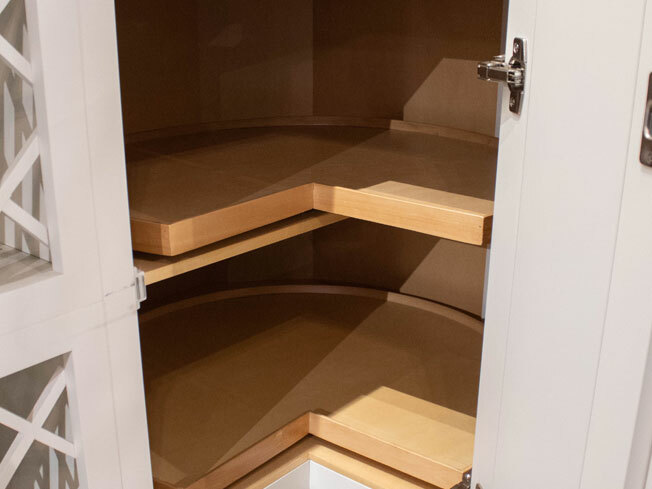 Organize your lids by placing the hooks on the inside of the cabinet doors. Use two hooks to hold the lids for easy storage. They’re also great for hanging your kitchen towels. If you want to go all out, invest in these hooks. 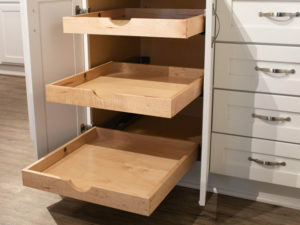 These five ideas are a small slice of storage and organization ideas out there. 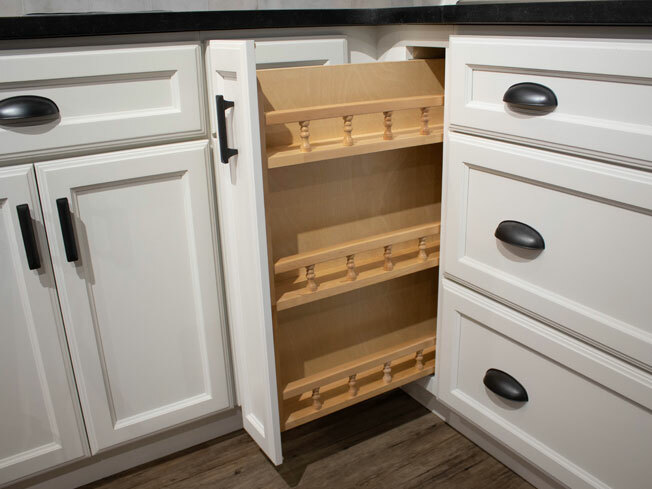 There are millions of ideas for storage and organization in your kitchen. If you’re looking for some more ideas, check out Pinterest. If you have any ideas of your own, I want to hear them! Leave them in the comments below.